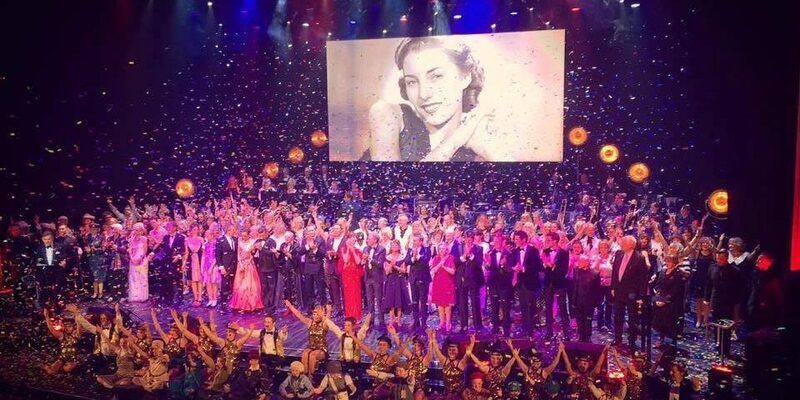 A local dance teacher put on her tights and high heels again to return to her roots and perform at the famous London Palladium theatre in a spectacular star-studded show which celebrated the 100th Birthday of Dame Vera Lynn. Kym Walton, who has been teaching dance at Windermere School for the last 9 years is joined her dance group from the 1970’s and 80’s to perform in the fabulous show. Dougie Squire’s Young and Second Generation dancers were synonymous with singing and dancing on all the top television entertainment shows here in the UK. The show, which featured stars including Sue Pollard, Bradley Walsh, Hayley Westenra, Wayne Sleep, Antony Andrews and Brian Blessed as well as the Tiller Girls featured 75 of the original Dougie Squires dancers who were renamed the Palladium Generation Dancers for the show. Dame Vera, who will celebrate her 100th Birthday on 20th March, also set records by being the oldest person to release an album, on the 17th March.